I’ve been busy in the shop building this new dresser inspired by IAONNE Design. This piece is a personal project for our master bedroom. The exterior is bamboo plywood. 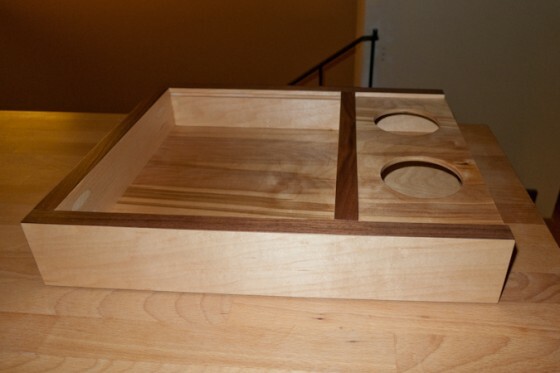 The drawer fronts are walnut plywood. 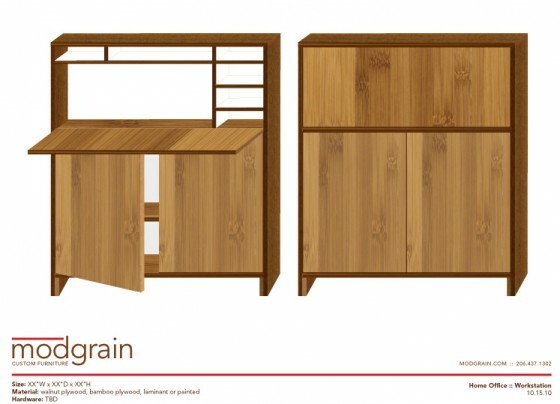 It has softclose Blum Tandem drawer slides and custom made aluminum and bamboo legs. It’s one solid piece weighing in at 150lbs (at least)! I sprayed it with a water-based satin finish. 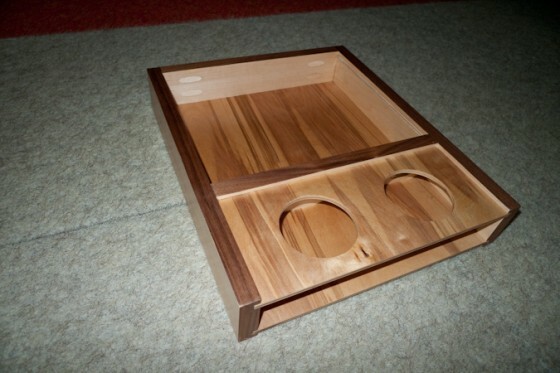 Natural, unstained walnut and bamboo make a beautiful blend. 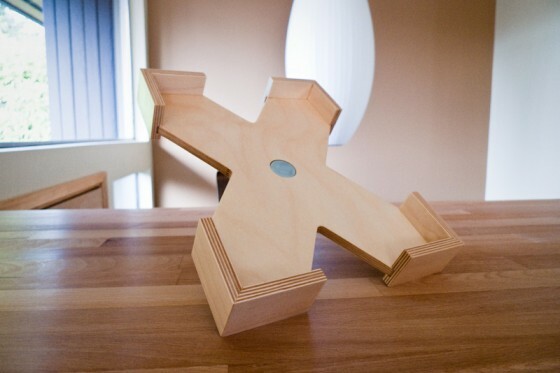 I’ve been working on a design that can replace you current workstation (aka your kitchen counter). 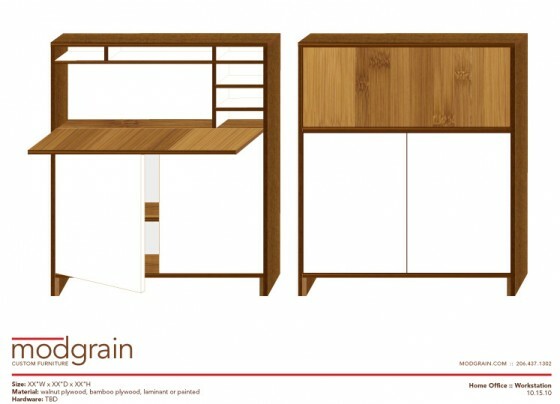 This is a functional workstation that can also be a conversation piece in any room. Especially if hand painted doors are incorporated. I would rather sit here and stare endlessly at Facebook or Twitter. And, once you see the status you were hoping for, you can close the laptop and fold up the top door to hide your obsession from any guests that might show up in person. This is a concept drawing that is as fluid your daily status updates. 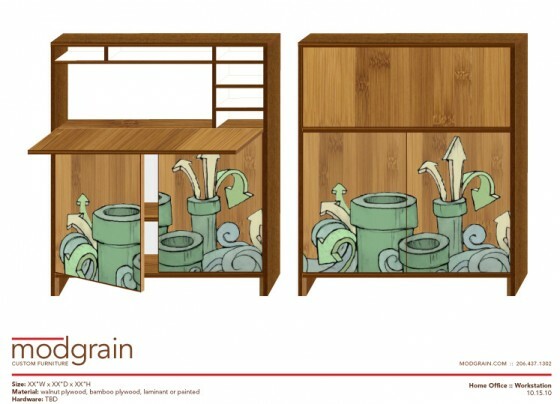 I’m currently leaning towards the bamboo and walnut plywood combination with a white melamine highlights on the interior. The painted door on “graffiti” has a very urban or industrial feel. I like this juxtaposition of a brand new satin finished piece with a loosely drawn and painted illustration. The possibilities are endless for colors and subject. Commissioning your favorite artist to paint the doors could be a reality! Let me know what you think! On this cold, gloomy Labor Day in Seattle, I have found myself working out a new jewelry box design. 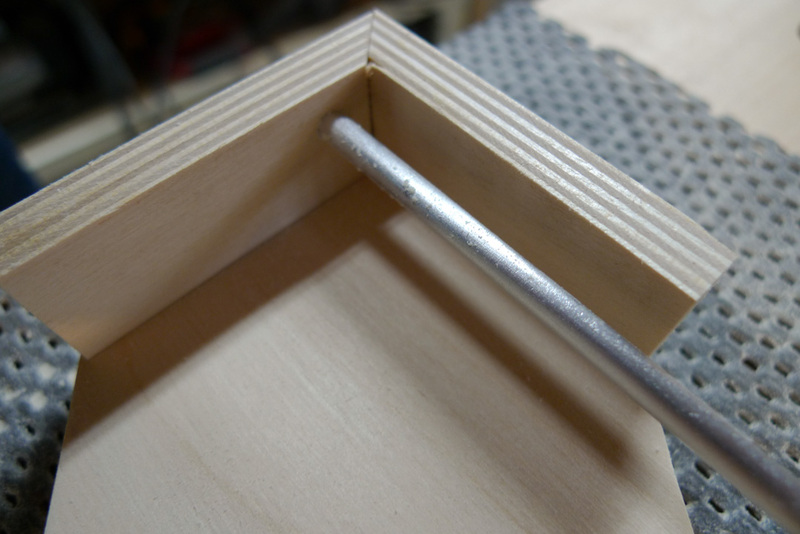 The construction will be the same as my previous jewelry box design… but with the a potential new flare. I’m thinking (in addition to laser engraving the walnut) of adding color or painting the graphic before applying the satin hand rubbed finish. These images represent some of my preliminary thinking. I’ll update you on this project as it comes together. A photographer in Florida, Manolo Doreste – In Focus Studios contacted me with a specific design requirement. He is planning to use 2 or 3 iPads at tradeshow type events where he will present his photography and video work. He needed a way to secure the iPad into the stand. Here is my design and prototyping exploration. On the last photo, I am considering adding a c-clip style locking washer… that will prevent anyone from slipping the rods up and out. 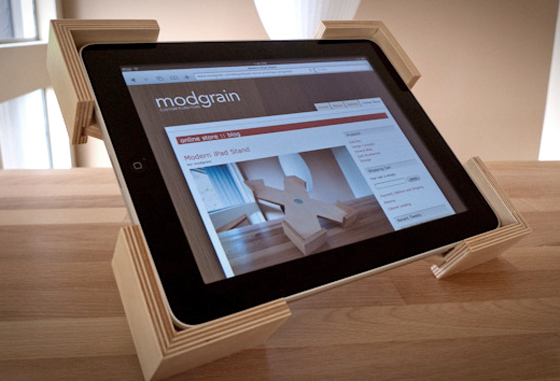 Contact us if you are interested in ordering a Secure iPad Stand. 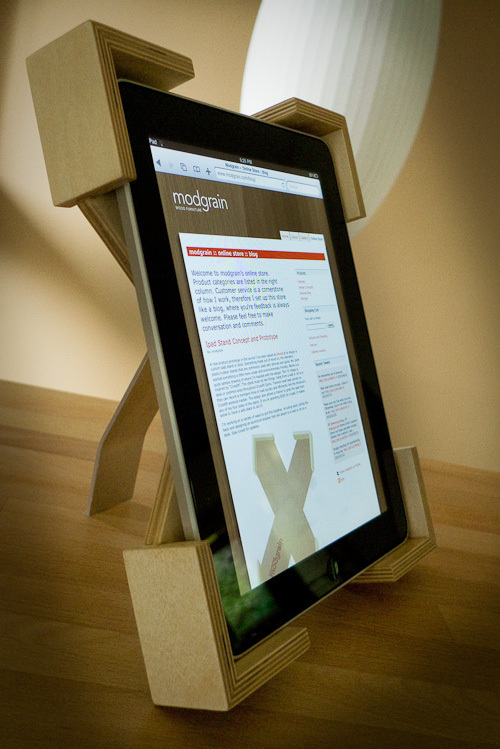 This is a beautifully designed modern wood iPad stand that features an aluminum bracket that can be mounted to a wall or simply sit on your desk. This is a great stand, especially if you’re looking for a hand made, unique and contemporary design style that is way cooler than the metal and plastic stands currently available. The viewing angle is 45 degrees and can be mounted for vertical or horizontal iPad presentation. 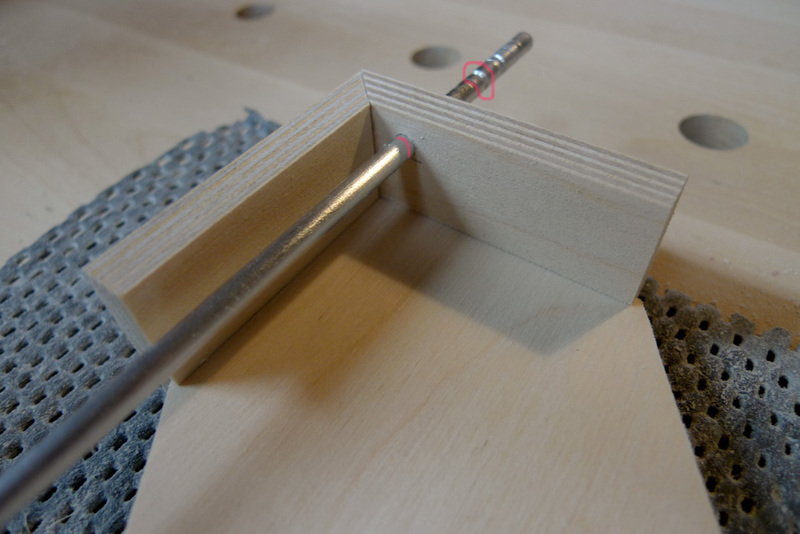 The design integrates a thumb knob on the back for easy adjustments to either viewing angle. There is a 1 inch zinc coated flat bolt countersunk in the center of the final stand that is not present in the above photos. The design allows for easy access for your USB connector. A new product prototype in the works! 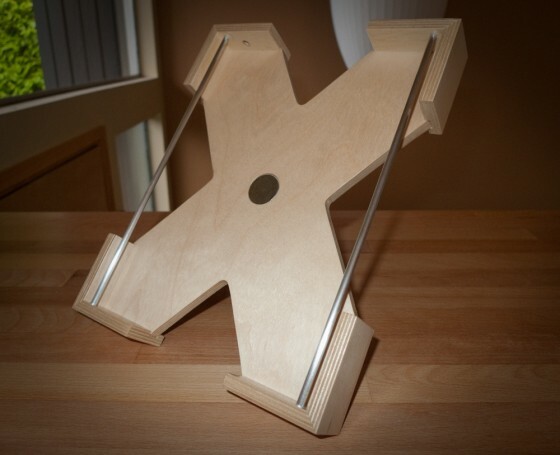 I’ve been asked by Wodclub to design a custom iPad stand or dock. 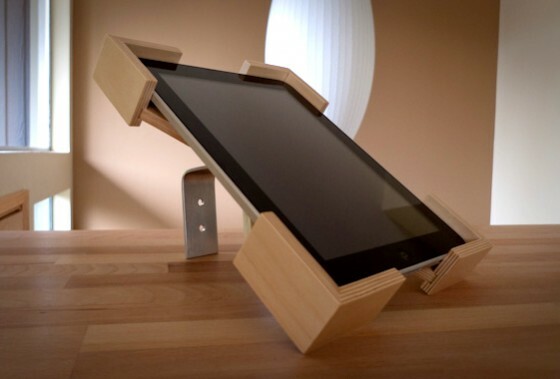 Something made out of wood vs. the standard, plastic/rubber stands that are commonly used with iPhones and iPods. My client wanted something a little more urban and environmentally friendly. Below is a quick sample drawing of where I’m headed with the design. 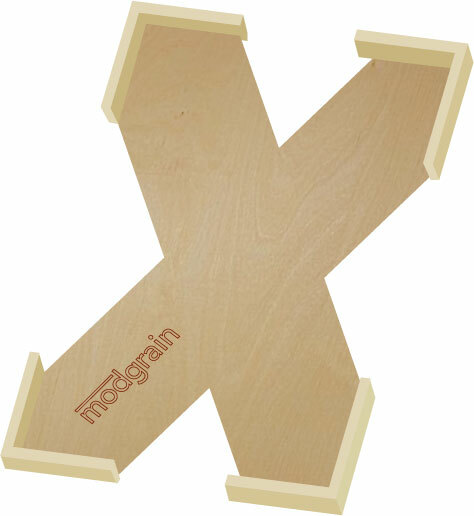 The “X” shape is inspired by “Crossfit”. 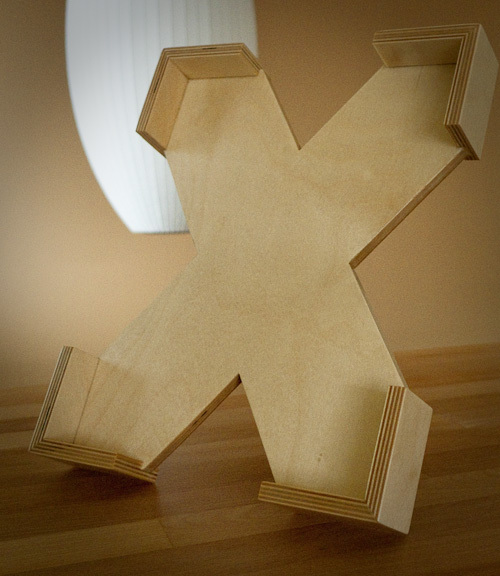 The stand must do two things…hang from a wall or sit on a desk or common area throughout Crossfit Gyms. Trainers need easy access so they can record a members time or load quickly and efficiently into the Wodclub’s Crossfit workout tracker. 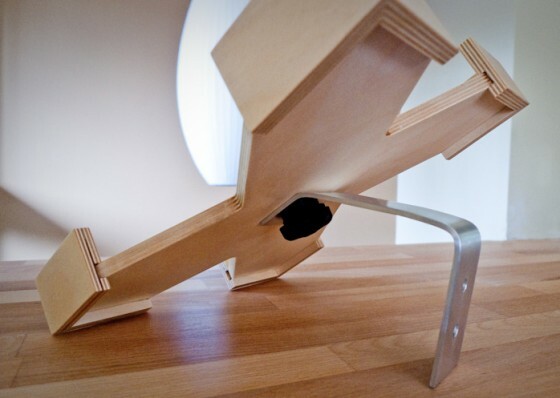 The design also allows a trainer to grab the iPad from any of the four sides of the stand. If you’re spending $500 for a iPad, it makes sense to have a safe place to set it! 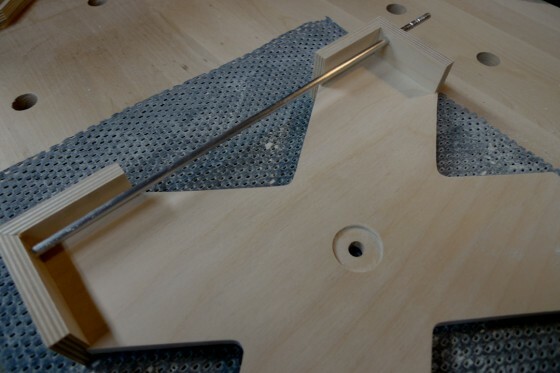 I’m working on a variety of ways to put this together, including laser cutting the back and designing an aluminum bracket that will attach to a wall or sit on a desk. Stay tuned for updates.